Mostly reports about situation and events in the territory of warfare in Donetsk and Luhansk regions of Ukraine contain information primarily for specialists in war crimes, human rights and international jurisdiction. I.e. for those who are professionals. Report “We live like in a reservation”, that was represented to mass media and public in general earlier this week, illustrates humanitarian situation and the plight of civilians in territories adjacent to the contact line. In fact, this is a unique perspective on common people’s life. The Report speaks about danger level and life/health threats that locals face every day, about complicated or limited access to education and dire state of schools, about medical aid issues, damaged and destroyed infrastructure, critical condition of local state authorities. The facts, that were gathered by the Authors of the Report, clear up all that despair, hopelessness and isolation of the locals from the ordered life, that is now a thing of the past, and from outer world on the other side of numerous checkpoints. The name “We live like in a reservation” is a how her life defined one of respondents from front line city Zolote-4 in Luhansk region. 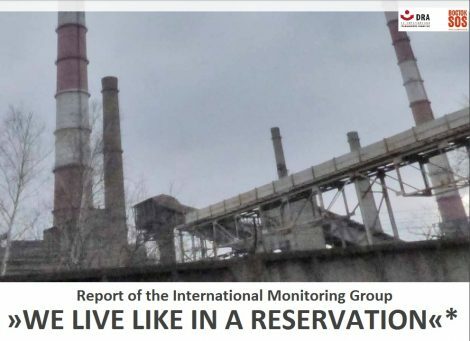 The Report “We live like in a reservation” is based on International monitoring group’s findings from the field monitoring mission in December 2017 as part of the project “Human rights monitoring in Eastern Ukraine 2017”. The organizations whose representatives participated in the mission are DRA (Germany); Humanitarian Route Belarus – ATO (Belarus); Natalia Estemirova Documentation Center of the Norwegian Helsinki Committee (Russia); Postup Human Rights Center (Ukraine); Team for Ukraine (Czech Republic); Truth Hounds (Ukraine); VOSTOK SOS (Ukraine). A representative of Truth Hounds also visited Donetsk and Luhansk regions under the framework of Monitoring and documenting human rights violation project that was carried out with support from National Endowment for Democracy.